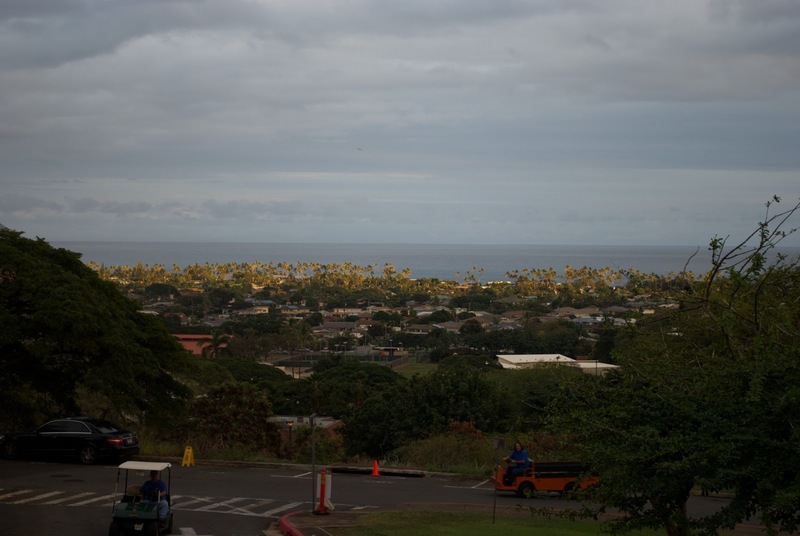 Today was the "official" start of TIP (Techs in Paradise) and the ESnet welcoming statement included some interesting information on some upcoming projects and their data needs. Up until now, most of the focus has been on the data requirements of the LHC (Large Hadron Collider) in Switzerland and trans Atlantic connectivity. There is a project in Australia and South Africa called the Square Kilometer Array that is projected to generate 700 gigabytes/sec of raw data which could be processed down to 0.1 terabits/sec of data to be stored and distributed. Kind of hard for me to comprehend that volume of data. There were other projects mentioned that would also generate LHC-like volumes of data but this one sort of stood out as over the top. In the middle of the talk, I was reminded (by my phone) that I was missing an audioconference. I had forgotten about the additional one hour time change from AKST but the calendar app didn't. The Japanese garden outside of the East-West Center seemed like a great place for an audioconference and the building blocked out most of the road noise. I'm not at all sure of what kind of tree this is but it is unlike anything we have back home. I couldn't get any closer as it was just across the creek shown in the first picture. 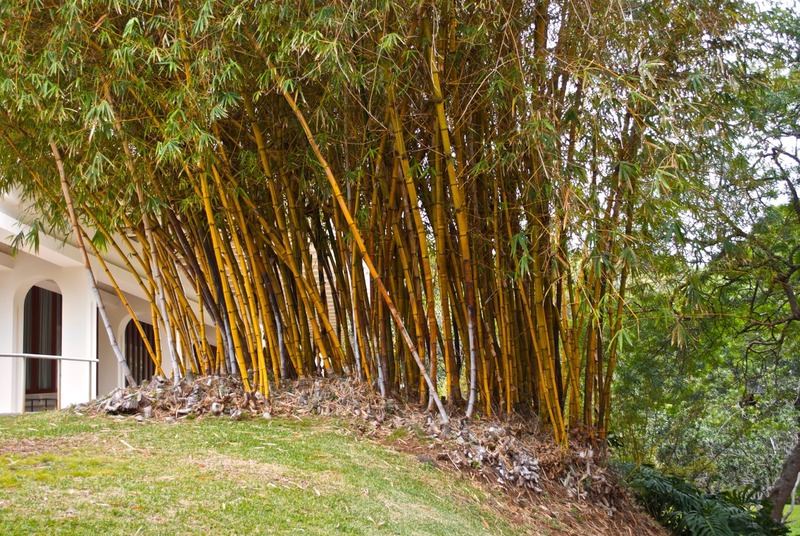 This stand of golden bamboo also helped block out ambient noise though it must have been home to a pile of birds from all of the chirping coming from within. Today was a great day to meet new people from all over the world as well as renewing friendship with some that I've known for years. At one of the breaks, a CS faculty member from a university in northern Malaysia came by and talked about their challenges and successes. At the end of the day, there was a reception catered by the culinary arts students from the Kapiolani Community College. 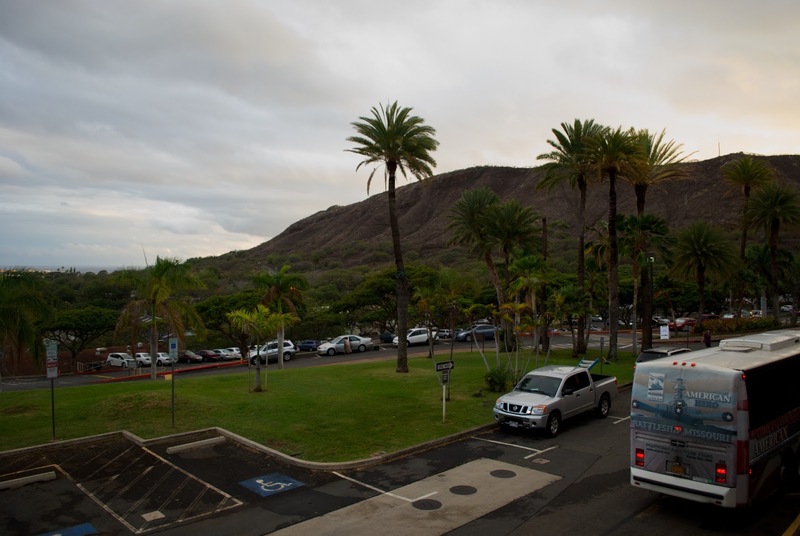 The school is on the flanks of Diamond Head and there was a wonderful view of the ocean from the balcony. It had been raining most of the day starting at about 11 and here the sun is just breaking through the clouds around sunset. It was an absolutely beautiful campus at a great location. I'm told that this is Diamond Head but I'm not really convinced. On the GoogleMap image below, we are located right about top/center of the image and I think we are we are looking towards the rim of the crater. 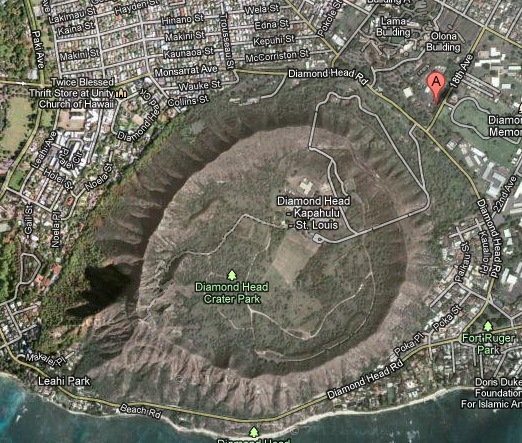 I didn't know that Diamond Head was part of a crater either. But maybe the name refers to the whole crater rim rather than just the peak visible from the beach area. The food at the reception was okay, not bad just not spectacular. The menu did include some stereotypical Hawaiian fare such as roast pork and a lot of asian food including three kinds of sushi. I arrived back at the hotel at the late hour of 8:00pm ready to crash. I must be getting old. There were many still trying to adjust from EST, which is 5 hours ahead, and they had a good reason to be exhausted. One of the other attendees from an unnamed northeastern location mentioned at dinner that he would be fine with getting a job handing out towels at the beach here rather than put up with any more snowy winters. Just because there should be at least one food shot, this was the cold noodle bowl that I had for dinner last night after the connector meeting. 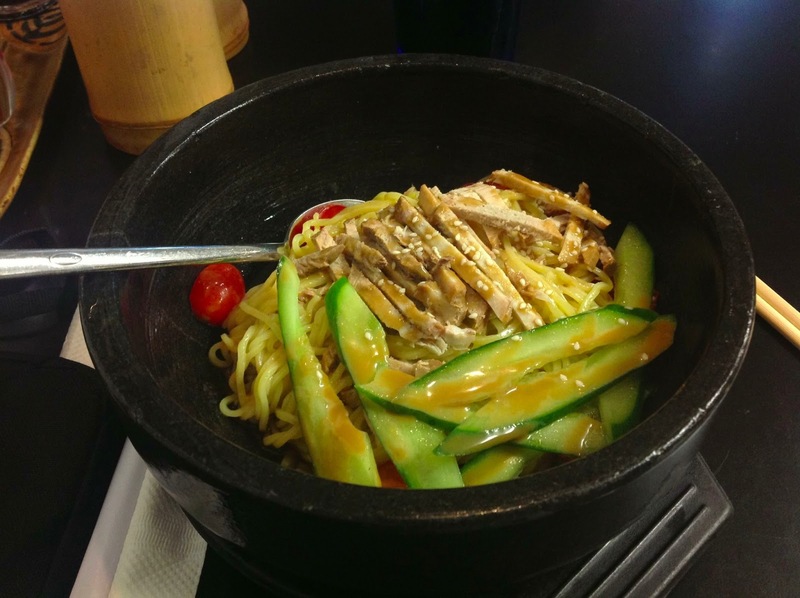 Cold ramen with chicken, cucumbers and tomatos. Like last nights meal, it was very tasty. They also had one dish which I had to try just based on the name. Pan fried cheese gyoza or dumplings. In addition to the normal filling of cabbage and ground pork, there was mozzarella cheese. You still used the same soy sauce w/vinegar dipping sauce. It sounds weird but was very good. A surprising combination. Tuesday Afternoon Update - Shuman's TIP 2013 blog post. You know, I thought I had finally landed a dream job. Now I think we must bow to you. The one consolation is that I don't have to deal with all that brain busting technical stuff! I can't complain at all about the job though I'm not sure it's in the dream job category. Being able to work with peers from this community over the years has been a real privilege and I'm sure you enjoy the same in your current position. Techs in Paradise - I like the name. Those gardens look beautiful. Sure is an interesting tree. I wonder if it is a type of young banyan tree. The name has stuck since the first meeting here in 2001. Back then they even had shirts made up with the phrase. I really like the gardens and when you are walking through them, most of the road noise is pretty much blocked out and the sound of the water masks what's left. I think a saw a sigh on the walkway identifying a lot of the plants. I didn't go out and look at it yesterday since it was pouring during the breaks. Tricky stuff meeting the rest of the world. Do they wait patiently while you lot sit around and calculate square kilometers ( 8 x 5 divided by...or is it division first?) and come up with proper measurements? There's an app for that on your smartphone, isn't there? Most of the regular Internet2 meetings usually have modest international attendance but since this is a joint meeting with APAN, the percentage is much higher. Maybe almost half of the attendees are from the Pacific rim. You deal with very challenging stuff. The LHC is darn interesting. I don't understand much of the matter but I still find it fascinating. I was also thinking Banyan tree. And I was also thinking baby banyan. Wonderful photos. That garden makes me swoon. I don't know what that little house-like structure is. My 19 pound black cat could use that as his guard shack. And that bamboo! I'm in tears! Cheese with that dish just doesn't sound quite right. There are those people who have to have cheese with almost everything, so maybe that was the deal. In WI dairy also shows up in the most unlikely places. 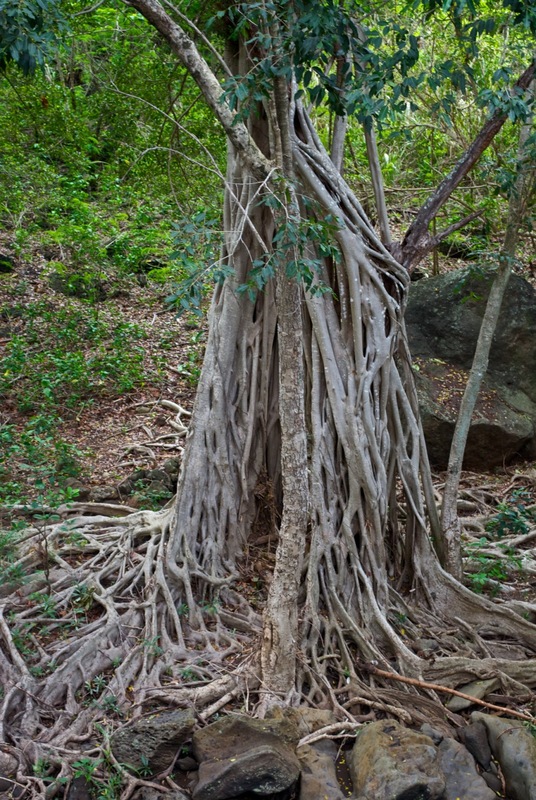 I think from some pictures on the Internet that it is a banyan tree. 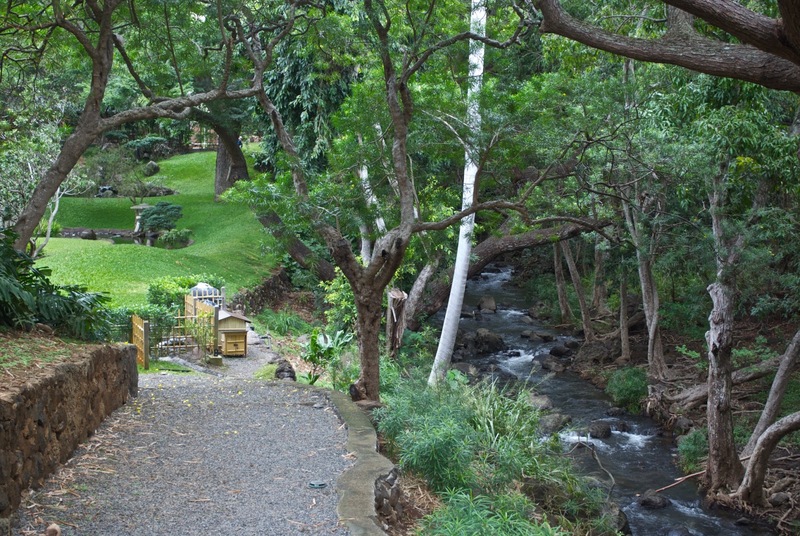 The little hut at the edge of the garden housed the pump used to filter and circulate the water for the waterfall and the little stream running through the garden. The gyoza with cheese didn't sound right at all but it definitely worked. Even with the regular gyoza dipping sauce made of a mixture of soy sauce, vinegar and chili oil went well with the cheese gyoza. I'd have it again. Beautiful gardens. I'm with the others /\. I could easily spend some relaxing time there. I love the location of the school. Great opportunity to go exploring the crater. I love learning about things like the SKA. I find it interesting when people think that an 18 GB database is huge...when i used to work with images where just one image was 8 GB. And I rarely worked with just one. The community college campus location was wonderful. Not just the ocean view but the grounds as well. 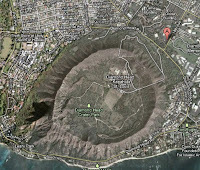 I heard that the access to Diamond Head was around there somewhere. Something about a tunnel. At 600', the height of the "peak" is much lower than I thought. I just think it's entertaining to hear of the projected data volumes compared to some of the Internet data caps the ISPs decide on.